Heavily constructed to extremely high standards by Stephens Marine of Stockton, California, CHINTA MANIS is a true oceangoing motor yacht with many of the attributes of a small ship. With a 4,000 mile range, she has crossed the Atlantic twice and the Pacific once and has cruised the Mediterranean, Caribbean, Bahamas, Alaska, French Polynesia, Fiji and New Caledonia. Her stately lines and seagoing appearance stand out in any port she visits. CHINTA MANIS’s layout features spacious accommodations for owners, guests and crew. There are also exceptional spaces on the aft deck, the sun deck and in the salon and pilothouse for group gatherings. Anyone seeking a well-maintained, long-range motor yacht of unique character would be well advised to have a look at CHINTA MANIS. United Yacht Sales New Jersey would love to guide you through a personal showing of this 86' Stephens Forward Pilothouse M/y 1975. 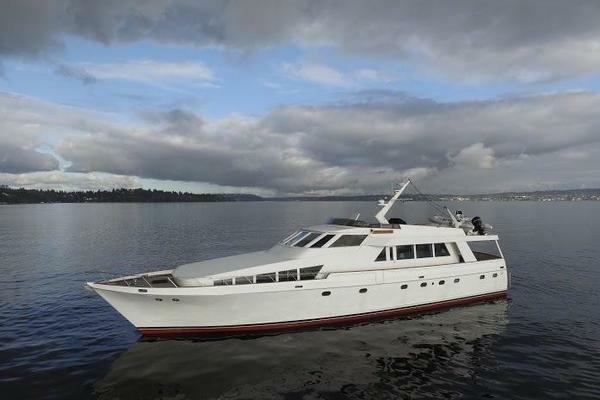 This yacht for sale is located in Falmouth, Massachusetts and priced at $850,000. For a showing please contact us by filling out the form on this page and we will get back to you shortly! Accommodations for six owners and guests in three staterooms aft, plus four crew in two cabins forward. Note: Walnut, ash and teak woods are used extensively throughout. Covered afterdeck, walk-around side decks and Portuguese bridge. The upper sundeck has a crane and stowage for tenders. AFT DECK: Spacious afterdeck with L-shaped settees/dinette tables, port and starboard, around transom stern. Built-in bar with refrigerator, freezer and ice maker at forward end. Stairs down to swim platform. PILOTHOUSE: Forward of the galley and up two steps is a true seagoing pilothouse. Excellent visibility is afforded through eleven large windows. Two of the forward facing windows have Eina rotary wipers and three have air-powered conventional wipers. There are doors, port and starboard, for access to wing docking stations with Wagner rudder controls and electronic engine controls. Behind the helm is a navigator’s room with a full-sized table, computer station and communications equipment. An L-shaped settee with large dining table is situated to port in the pilothouse. CREW QUARTERS: Down a flight of stairs in the forward starboard corner of the pilothouse are the crew’s quarters. Crew accommodations are for four in two staterooms, each with head and shower. The crew also has its own lounge area and mini galley with sink and microwave. Two large port lights behind the crew settee make this area bright and comfortable. There are 2 Sea Frost freezers (over/under)in the passageway at the base of the stairs, along with laundry facilities and a large pantry originally designed as a photographic dark room. Below the floorboards in this area is a large storage compartment. ENGINE ROOM: The engine room is accessed through a bulkhead door in the crew lounge. Access can also be obtained from on-deck through a door behind the pilothouse on the port side. All major machinery is located in this spacious compartment, including all batteries, chargers, water makers, inverters, generators, holding tank and head pumps, fuel manifolds, exhaust fans etc. There is a workbench with built-in toolboxes along the forward bulkhead. ON DECK: Forward of the pilothouse is a well-protected Portuguese Bridge. Stored in special compartments are two spare propellers, storm windows and, on the upper deck, a spare propeller tail shaft. Access to the upper deck is via a stairway on the starboard side deck aft. The upper deck has a spacious area for sunning, plus a full-width wrap-around U-shaped settee and large dining table aft. A heavy-duty hydraulic crane sits mid-deck for lifting a 14’ hard-bottom inflatable and a 10’ sailing/rowing dinghy. All lower deck surfaces are heavy laid teak. The sun deck is non-skid Awlgrip. Engines and generators combined burn approximately 15 gallons per hour at 9.5 knots, giving the boat a cruising range of some 4,000 nautical miles. Starred items (*) are not currently onboard, but do convey with the sale. The owner’s personal effects are excluded from the sale.